The Glee Club will present a joint concert with the University of Indianapolis Women’s Chorus at 8 p.m. on Saturday, March 29 in Salter Hall in the Fine Arts Center. This year’s concert marks the 10th year of this musical collaboration. 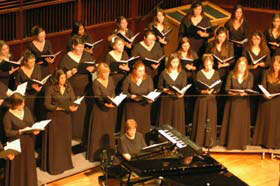 The program will include selections by the Women’s Chorus, the Glee Club, and the T-Tones. The groups will combine their voices for Hwayana Yamwari, a piece set in the style of choral music heard in Zimbabwe and accompanied by a variety of percussion instruments. For the final selection of the program, the Crawfordsville Community Chorus will join the two college ensembles to form a 90-voice choir. They will perform Lord My God, Assist Me Now, a lively baroque composition accompanied by a string ensemble .